Two iconic Central Florida organizations, Daytona International Speedway and Florida Hospital, announced today a multi-year partnership that will make Florida Hospital the second Founding Partner at Daytona International Speedway, as part of its historic $400 million DAYTONA Rising redevelopment project. Providing high-quality medical services and new fan experiences at the “World Center of Racing,” Florida Hospital will inspire the community to race toward better health. Beginning in January 2015, Florida Hospital Volusia/Flagler will be the exclusive healthcare provider of Daytona International Speedway, which includes providing medical equipment and personnel for all events, managing the care center operations and providing ambulances to handle emergency situations. Arriving in a Toyota Camry pace car, Daytona International Speedway President Joie Chitwood III and Florida Hospital Volusia/Flagler CEO Daryl Tol shared the unprecedented announcement on the West end of Daytona International Speedway’s frontstretch. The massive DAYTONA Rising project, encompassing the Speedway’s nearly one-mile long frontstretch, will be complete by January 2016. The project will transform the Speedway into the world’s first motorsports stadium with premium amenities and attractions unmatched in the industry. 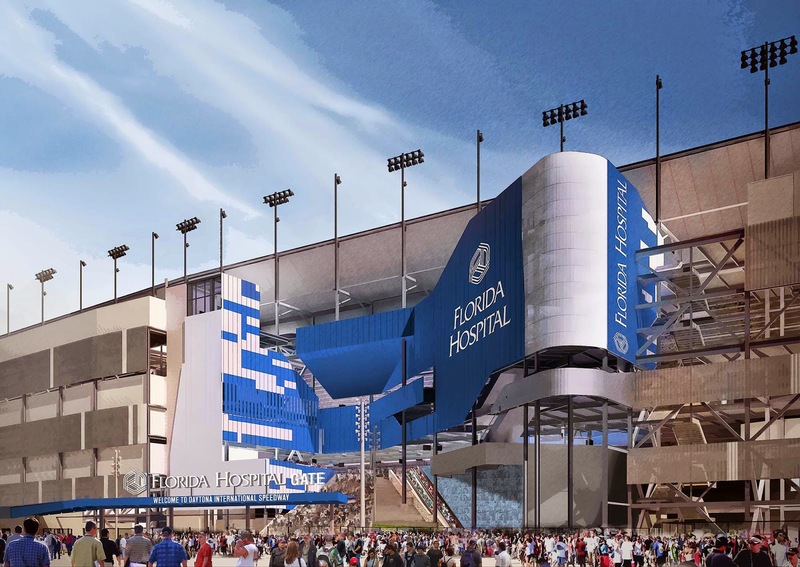 The Florida Hospital brand will be represented on one of five special entrances called fan injectors, including more than 20,000 square feet of engagement space. Within this injector, Florida Hospital will have a presence in one of the “neighborhoods” which will encompass retail and dining areas, as well as dozens of video screens to provide fans with non-stop views of on-track action. In addition to serving as a Founding Partner of DAYTONA Rising, Florida Hospital will be an inaugural partner in ONE DAYTONA – a premier 190-acre mixed-use retail, dining and entertainment development across from Daytona International Speedway. Farm to Table Dinner For A Great Cause!